Both were determined to know who was best! 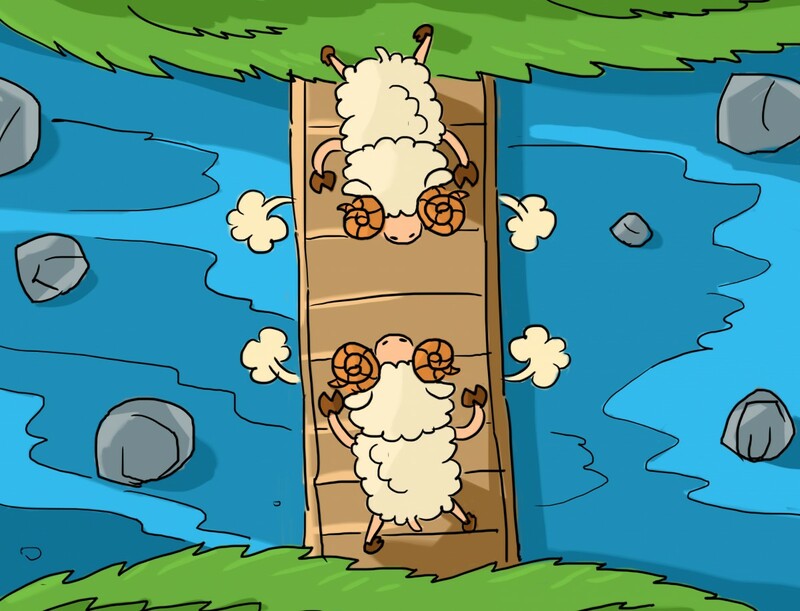 Each day, two goats crossed the same bridge. The goat from the east crossed the bridge to graze on the grass of the mountain in the west. The goat from the west crossed the bridge to graze on the grass of the mountain in the east. One day the goats both started across the bridge at the same time. They met in the middle of the bridge. The goat from the east could not get to the west. The goat from the west could not get to the east. Neither could get past the other. "Back up," said the goat from the east. "I am crossing this bridge." "You back up," said the goat from the west. "I will be the first to cross. You may go after me." Neither goat could go forward. Both refused to go backward. First, they puffed themselves up to look bigger. Next, each tried to out shout the other. Then they bent their heads forward and aimed their horns at the other. They locked horns and pushed and pushed. They pushed each other off the bridge and into the waters below. Was a lesson learned by either? I fear it was NOT that day. They both shook off the water and went upon their way. As the goats both walked away, they both could be heard to say, "If he had not been so stubborn, we both could have eaten today!"